After a long, cold winter, it’s time for some warm weather, summer vacations, and additional help from interns. But are you fully prepared to support your new interns this summer? Regardless of your industry, company size, or department, hiring new team members may present a challenge when it comes to acclimating them to your company. Intern or not, properly training a new hire likely requires a significant amount of time and effort. It’s no secret that employers could use a little help when it comes to familiarizing summer interns with a professional environment. There are endless variables to consider when hiring interns for the summer. Will this be their first full-time gig? 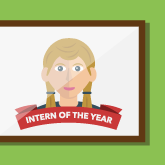 How much (or how little) experience does your intern have? How are their communication skills? Presentation skills? Will they be able to catch on quick, or will they require a bit more hand-holding? These are just some of the questions to deliberate when preparing to onboard a new summer intern. With the diverse selection of candidates, you can better prepare to get the most out of your interns by using two easy, universal tips. This means not only identifying the tasks your intern will work on, but preparing your employees to work closely with the intern as well. In an Entrepreneur article, author Dorie Clark advises employers to make a comprehensive list of the projects you’ll need help with even before thinking about hiring an intern. Organizing your agenda will help align your expectations on qualities to look for in an ideal intern. From there, it’s equally important to keep in mind what your intern is looking to gain from this internship. This way, you can adjust their schedule as needed to fulfill their goals in addition to your own. It is imperative to set up your intern for success within your organization, and their overarching responsibilities should be valuable in helping them further develop their overall professional skills. Preparing internal stakeholders within your organization to support an intern will also prove to be worthwhile. Identifying an employee who can serve as a mentor to your intern will help foster a good relationship between the intern and the company. A good way to provide feedback in particular, is by dedicating a mentor to your interns. From the interns’ perspective, having a mentor will help develop their work skills and teach them how to do things first-hand. Their mentor will also ideally serve as their go-to point of contact to learn more about your company itself, which will serve you well if you want to consider hiring them one day. When it comes to employee satisfaction, you equally owe your interns just as much as they owe you. Therefore, your interns deserve to see that your company is a place they would enjoy working and growing in their career. Setting them up with an attentive mentor who provides consistent feedback and check-ins will likely make them feel like they are a part of the team, rather than a temporary fix. Dorie Clark from Entrepreneur also suggests, if your intern is volunteering their services, you need to understand what they’re hoping to get out of the experience. From the employer’s perspective, assigning a mentor to your intern will provide you with the benefit of keeping a pulse on the status of specific projects. Based on the assigned mentor’s conversations with the intern, they can report back to you to identify any potential issues or need-to-knows as well. With these two tips, you can easily make your intern’s experience at your company more beneficial to the both of you. With adequate preparation and consistent engagement, you will set yourself up for success in providing a well-rounded experience for both you and your summer help. A good internship can either make or break whether an intern would be interested in joining your company next year or even coming on full-time when they graduate. If they have a poor experience at your company during their internship, they may be less inclined to want to work for you in the future. Remember to be considerate of their pace and be mindful of what they are looking to take away from this experience. From there, you can feel confident that they will provide you with top-notch work within their capabilities. An internship is more than providing you with assistance on daily tasks; it is an opportunity to develop a newly-experienced person in the workforce.